We hope you enjoy your visit to these pages as you learn more about our chapter history, what we do, our patriot ancestors, how to join us, and resources to celebrate patriotism, support education, promote historic preservation and research your own family history. Most of all, we, as Daughters of the American Revolution, stand with humble gratitude, never forgetting our patriots' contributions and monumental sacrifice of life and home, to establish our glorious nation! Society of the Daughters of the American Revolution. 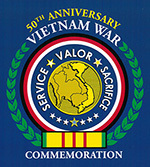 We are an official Commemorative Partner honoring Vietnam veterans.